NORTH BAY, Ont. 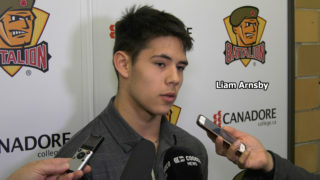 – Zach Bratina scored three goals, including an empty-netter, to power the North Bay Battalion to a 5-3 victory Monday over the Mississauga Steelheads in the Troops’ annual Thanksgiving Day game. Austin Kosack and Miles Liberati also scored for the Battalion, which won a third consecutive game to even its won-lost-extended record at 3-3-0 for six points, third in the Ontario Hockey League’s Central Division, one point behind Mississauga at 3-4-1. Battalion goaltender Jake Smith made 33 saves to register his 63rd career win, tying Patrick Killeen for second place on the franchise list, one behind club-record holder Bryan Pitton. 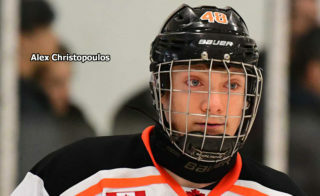 Alexander Nylander had one goal and one assist for Mississauga, which got its other goals from Daniel Muzito-Bagenda and Everett Clark in attempting to rally from a 4-0 deficit. Starting goaltender Jack Flinn surrendered four goals on 16 shots before Cameron Zanussi came on in relief at 12:00 of the second period, facing six shots the rest of the way before 3,208 at Memorial Gardens. The Steelheads, who defeated the visiting Kitchener Rangers 3-2 in overtime Sunday after trailing 2-0, were sparked in another comeback effort by Nylander’s goal past the sprawling Smith at 19:08 of the middle period. Swedish import Nylander, the league-leading rookie scorer, has a team-leading five goals and seven assists for 12 points in eight games. After Smith denied Josh Burnside with a brilliant glove save at 6:58 of the third period, Muzito-Bagenda scored on a counterclockwise wraparound at 16:36, jamming the puck behind the goaltender, and Clark connected at 17:49 to pull Mississauga within 4-3. Zanussi left for a sixth attacker with 1:40 to play, and Bratina scored his team-leading sixth goal into the empty net at 19:56. 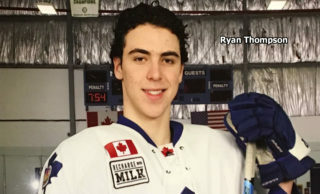 He had an empty-netter in a 3-1 decision Saturday night over the host Sault Ste. Marie Greyhounds. Bratina scored unassisted 48 seconds into the first period after stealing the puck and splitting the defence. 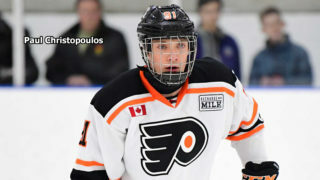 Defenceman Kosack connected at 13:40, taking a pass from Brett Hargrave on the right wing and driving to the net to chip home the puck. Flinn made a sterling save against a Hargrave one-timer from the left side at 10:40, and the Battalion’s Mike Amadio hit the right post in the 19th minute shortly after the Troops killed a hooking penalty to David Sherman. Liberati scored at 7:03 of the second period, moving to the top of the left-wing circle and wiring a shot past Flinn on assists by Kyle Potts and Max Kislinger. The assist on defenceman Liberati’s second goal of the season was rookie Potts’s first career OHL point. Bratina took a pass from Brett McKenzie and broke behind two defenders to beat Flinn on a forehand deke at 12:00, ending the goaltender’s crease time. The Battalion hosts the Oshawa Generals at 7 p.m. Thursday in the annual Pink in the Rink game, sponsored by Allstate Insurance in support of the Canadian Cancer Society. BATTALION BULLETS: The Battalion has a won-lost record of 12-6 in Thanksgiving Day games, including two losses in overtime and one via shootout. The Troops have won all three games at North Bay on the holiday … The Toronto St. Michael’s Majors, forerunners of the Steelheads, won 5-4 in overtime at Brampton in the first Thanksgiving matinee, on Oct. 12, 1998. The franchise now operating as the Steelheads has been the opposition 13 times … North Bay’s last loss was a 4-2 setback Oct. 1 to visiting Kitchener … The Battalion went 0-for-4 on the power play. 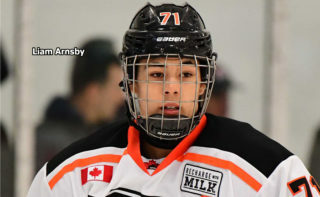 Mississauga was 0-for-3 … Opening line combinations included Amadio centring left winger Bratina and right winger Justin Brazeau, McKenzie pivoting left winger Mike Baird and Zach Poirier on right wing and Calvin Gomes centring left winger Sherman and right winger Hargrave. 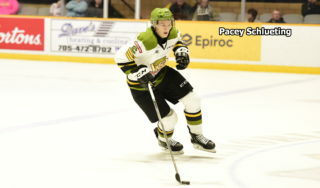 Potts centred left winger Kislinger and right winger Kyle Moore … The Battalion scratched Kyle Wood, Jake Ramalho, Jacob Ball, Brady Lyle and Mathew Santos, who served the third game of a four-game suspension … Ball has concussion-like symptoms after being checked into the boards from behind by Bobby MacIntyre at Sault Ste. Marie. MacIntyre received a major penalty and game misconduct … The referees were Sean Reid and Tom Sweeney.